When the U.S. soccer team plays Brazil this afternoon in the Confederations Cup final, the stadium will be buzzing with the sound of plastic trumpets called vuvuzelas. 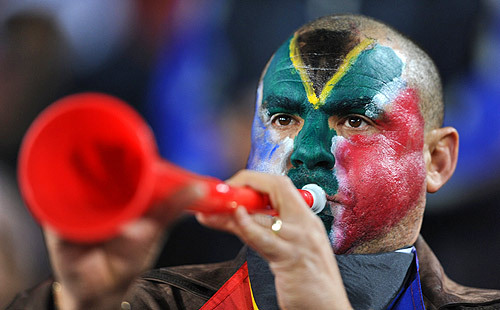 (See Delia Robertson "Vuvuzela: Popular Symbol of South African Football", VOA News, 6/25/2009). That site claims that the device originated with a "women's Chinese basketball team"; reminds us to "REMEMBER… YOU ONLY HATE THEM, IF YOU DON’T HAVE ONE…"; and observes that your vuvuzela can also be used as a cricket bat, hearing aid, petrol funnel, water sprayer, drinking funnel, 4G mobile communication device, walking stick, light saber, and jousting stick. Hatred of the vuvuzela, the noisemaker wielded by South African soccer fans, ignited the blogosphere even before the FIFA Confederations Cup, the country's dry run for 2010, which ends today when the U.S. national team plays Brazil for the championship. During the current tournament, foreign players, coaches and journalists have called for a ban of the vuvuzela. There is debate about whether it's a unique part of South African culture, and therefore untouchable, or just a cheap plastic import that makes a lot of noise, like an electric air horn or a whistle. One vuvuzela — a loud, tuneless blast — sounds something like a foghorn. But a stadium full of vuvuzelas, all tooting simultaneously, is either a most exhilarating and exciting sound or a noise so irritating that it borders on being painful, depending on the listener. It's been compared to a deafening swarm of wasps. Or a herd of flatulent elephants. There's uncertainty on the origin of the word "vuvuzela". Some say it comes from the isiZulu for – wait for it – "making noise". Others say it's from township slang related to the word "shower", because it "showers people with music" – or, more prosaically, looks a little like a shower head. And the deafening blare of the vuvuzelas that some teams at the Confederation Cup have complained about? The Americans don't mind them one bit. "I think we've shown a spirit and competitiveness that people love, and that's infectious for people," [Landon] Donovan said. "We expect the same for tomorrow night, too, that people will be out there wanting to see us do well, and we thrive off that." Then there's also the makarapa. From the attack in the sound file, I get the impression it calls for something like a trumpet embouchure–it's not enough just to force air through it, as with a kazoo. Thousands of football fans who know how to do that? Terrific. Blast away. The vuvuzela is truly irritating. The sound files in this post don't really accurately portray just how these things sound in a stadium (the boogieblast one is more accurate, but usually you can't hear any other crowd noise any more over the buzz of vuvuzelas). It actually sounds more like a large angry swarm of bees has invaded the stadium. I kinda hope they do ban it. I imagine Donovan waiting until he's certain the microphone is off, and then hissing "They must all be destroyed!". No player would dare seem to be anything less than enthusiastic about the horns lest their owners turn them on him. They're horrible. They make it impossible to watch the matches. They remind me of the red trumpets that are a staple of the Quebec Carnival. They're very similar to the ones seen and heard in South Philly during the Mummers' Parade every New Year's Day. I like the sound of "vuvuzuela" a lot better than "cheap plastic trumpet" though! That horn ranks right up there with my least favorite **indoor noise — those horrible "clackers" at basketball games! If these are what I think they are, they've been fairly commonplace at American college football games for decades; since at least the 80's I think. Commonplace but not ubiquitous. Another reporter suffering from recency illusion. Air horns and "trumpets" are common and customary in stadia in all sorts of places. The custom of "everybody" bringing one and using it constantly MAY have started with Japanese soccer fans and their horns powered by cans of compressed air. The fans use their horns for the full 90 minutes of a soccer game. Cacaphony!?!? In Bahrain, some fans play an arab flute and sing a chant for the entire game. Brazilian fans are partial to samba whistles (and other whistles) sounded with a samba beat. The South African name is attractive. Good luck with the idea of banning them. I asked my brother back in South Africa how South Africans feel about this and he said that even my 77 year-old mother has one, and that she can produce a respectable amount of sound from it. They have been an intrinsic part of the soccer-spectating experience in South Africa for years. The fact that there is so much discussion about them in the international media, which is experiencing them in a South African setting for the first time, shows that irrespective of their origin, the way they are used at matches is uniquely South African. South Africans know this, and would be deeply offended if there were any attempt to ban vuvuzelas. i assume "hatas" is supposed to be "haters", pronounced non-rhotically? it took me a few extra seconds to figure it out, as the spelling suggests a [ɒ] for the first vowel, not a [eɪ]. interestingly, i can't think of a better way to write it, and "playa-hater":"playa-hata" is nearly 2:1 in ghits. This seemed like the perfect chance to try out Wordnik. Entering 'vuvuzela' only returned Twitter results (too new of a word I suppose to be in any more established source of theirs). It has cultural significance in South Africa, and some relevance to 2010. It's something you might need to learn to 'blow' for the 2010 World Cup. It is not an air horn, despite what 'stupid Americans' have said. A more in-depth explanation of the word could be found on some place called 'Language Log'. (This very post of course). I think the link to LL is somewhat fortuitous, but it's interesting to see at least a partial understanding one might get purely from seeing it used. Can't the sound be filtered out by broadcasters? Doesn't seem like it would be too complicated. The vuvuzela, contrary to revisionist history, is not a traditional South African trumpet, but the product of a very recent, corporatist inspired history. That's problematic of course, but I would even be forgiving, if it wasn't so annoying. A truly annoying and monotonous noise that drones on continuously throughout the game. There is no noticeable variation in the sound that would suggest a response to what's happening on the ground, or any interest by the blower in the game itself. One cannot hear any other singing or cheering by people who are actually following proceedings. If the Saffers are so keen on this then they're welcome to it. I watch a lot of football on the television but have turned off games in the past because of this idiotic noise and I'm not surprised there is a serious attempt to at least tone it down, but how can that be done without banning it altogether? And screeching tennis players can take a hike too. BAN THIS AWFUL THING AT http://www.banvuvuzela.com !!! !